It’s spring time and that means slugs for so many of us. 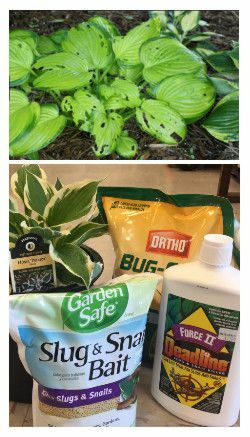 For a slow moving bug, it is amazing that these critters can even find desirable plants in our garden, but they love hosta and find ways to get near these plants, especially in the spring! If you are seeing holes in your low-growing plants, such as the holes on hosta leaves like those in the picture to the right, then you likely have snails or slugs in your garden. Kill these bugs early enough and you plants will survive and still look healthy for the season. How do you kill these bugs, when you rarely see them? Slugs come up out of the nearby soil in the night time and feed on low-growing leaves. As a result, we rarely see them, but their damage is obvious. Controlling them is quite easy, and you do so with a granular snail and slug bait. These products are applied around the targeted plants as a barrier treatment. The slugs are lured to this bait before they climb up plant leaves. Once they ingest the bait, they die shortly after. Sometimes you will see then died on nearby surfaces, other times they die back inside the soil and you will not see them. I have had great success with the Ortho Bug Geta product, which is chemical-based bait. We also have a new liquid gel product called Deadline; It is used in the same manner and has been proven to be highly effective as well. Is there an safer variety when being used kids and pets? Yes, there is! Zinc phospate is the main ingredient in safer products and it is still highly effective. We carry several types of safer snail and slug baits including one from Bonide and another from Garden Safe by Schultz.